It all begins on a chilly Tuesday morning in Cuzco’s Plaza Regocijo. We met at some ungodly hour of the night (I later found out it was 4:30am), and boarded the bus to our impending doom. After a hearty breakfast at Ollantaytambo with some sketchy tasting milk, we continued our drive to the location known only as Kilometre 82, literally a railway milepost with an Inca Trail control point attached. The previous night, I had determined that I was not the only one to have timed this trip with the End of the World, which was quite the non-event. Shortly after booking, I realised I had gotten my ancient civilisations mixed up and kicked myself. 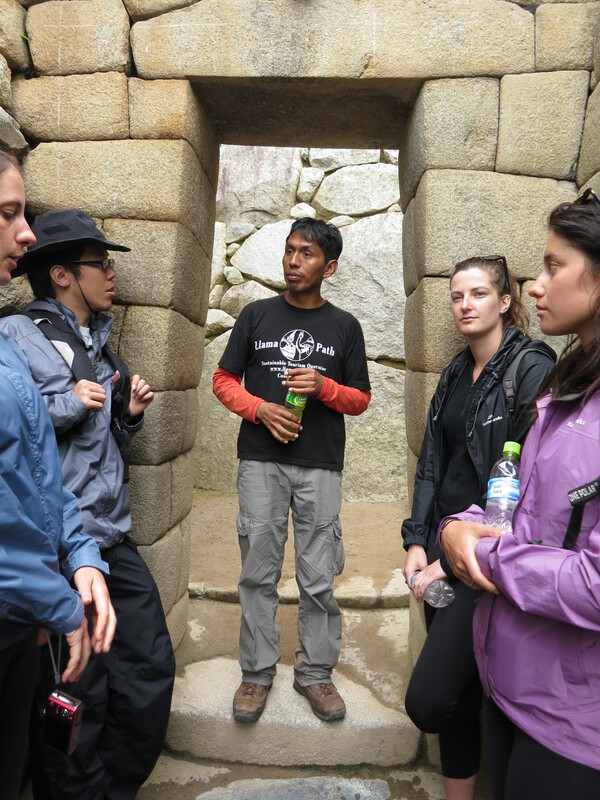 However, I was comforted by being told that being at the sacred Inca site of Machu Picchu on the day of doom, I would be safe. We assembled ourselves in the queue to get our tickets and passports checked, and it quickly felt like I had entered The Amazing Race, except a lot more effort, no flights and over a significantly lesser geographic area (perhaps it was actually more like I’m A Celebrity… Get Me Out Of Here). Being on the Race is something I’ve always dreamt of, just not in this way. As our main guide Flavio (who incidentally looks nothing like Phil Keoghan or Grant Bowler) threw out his arm to signal the start of the trail, we were off and racing, scrambling across a precarious timber and rope suspension bridge littered with donkey and llama excrement. One slip (followed by a consequent stumble and a failure of the handrail and netting) would have seen us fall to the unforgiving rapid river flowing below. We made it across alive – 100 metres complete, 44900 metres to go. 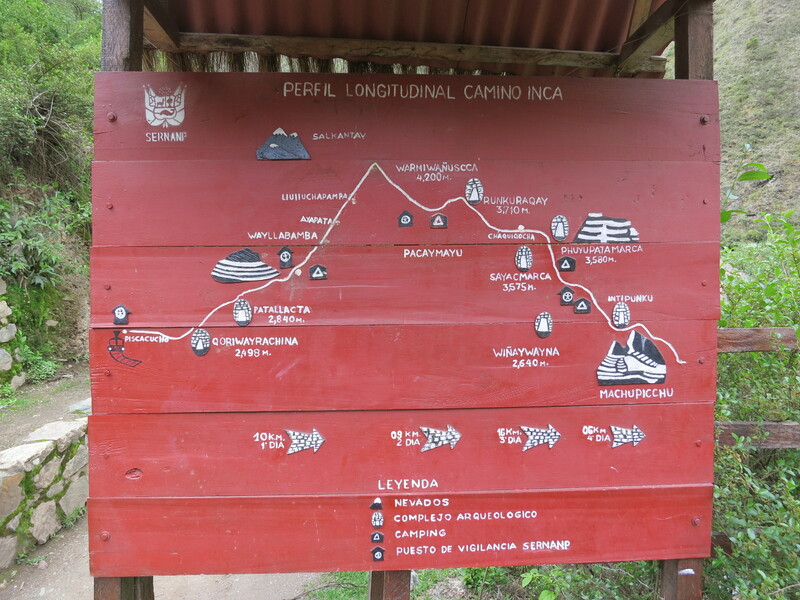 The first day was called the ‘Inca flats’ where the better part of the day hovered around the same elevation, before a sharp 300m vertical ascent to the first campsite at 3300m elevation. Unfortunately, ‘flats’ are not really flat in the traditional sense. As reflected upon by a friend on Facebook the day before, ‘flats’ really just mean that there are an equal number of uphills and downhills. I found this to be true. The final ascent to camp amid dwindling light was tantamount to torture – we were wrecked. After we made it, we never thought we would make it to the top of Dead Woman’s Pass, at 4200m altitude. 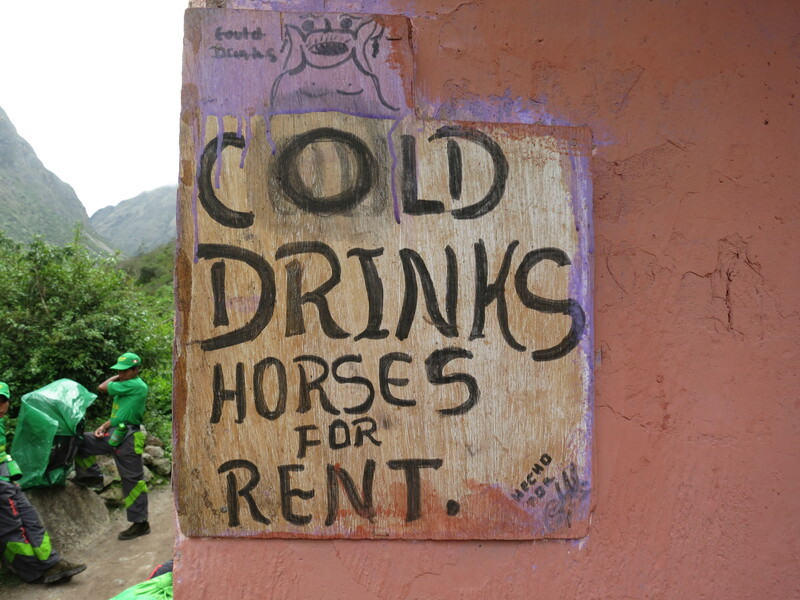 Apparently, the donkey ambulance only provides service on the trail covered in the first day, which compounded our concerns, and I began noting potential helicopter landing sites as we walked. Climbing the 285 metres up Townsville’s Castle Hill, which was my Inca trail practice, while much steeper, is nothing like climbing a similar distance vertically in the Andes. The difference is oxygen. At sea level, air pressure is typically around 1013hPa. At the top of Dead Woman’s Pass, the air pressure is closer to 620hPa, or about 40% less oxygen. When we arrived at camp, we felt almost instantly refreshed. Luckily, most of our belongings were carried by the super-fit porters, so we were left with only the small day-pack with what we needed during the actual hiking. The tents were set up by the porters before we arrived with our sleeping bags rolled out. A tub of hot water and liquid soap was available at the front door of my tent. 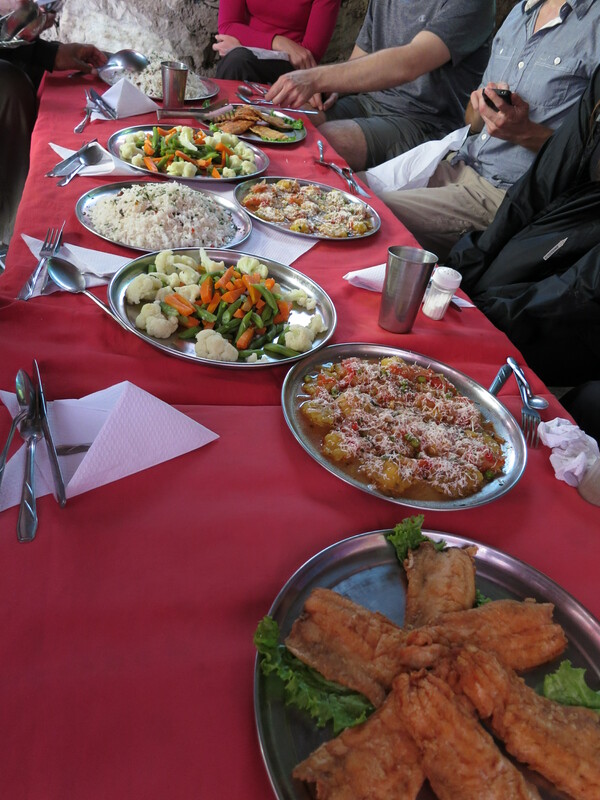 Copious amounts of coca tea and popcorn were available in the dining tent for ‘happy hour’. And of course, we got to enjoy the incredible view we had earned over the valley we had just climbed up. 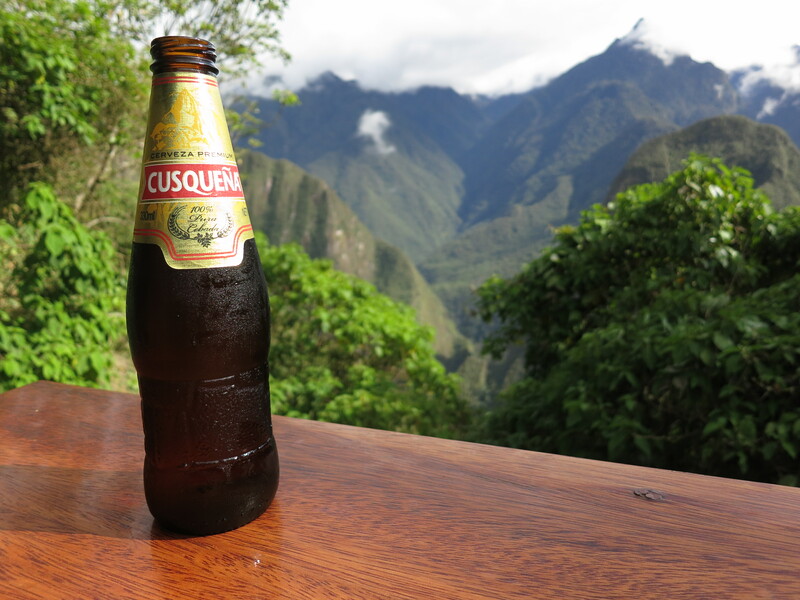 Oh, and there was the Peruvian woman selling Cusqueña cervezas for 8 soles ($3.20) – high by Peruvian standards, but then again so was the altitude. The food we had for breakfast, lunch and dinner was delicious. In fact I brought along way too many snacks. They fed us incredibly well, and there was not a meal that was not immensely satisfying. There were many characters we encountered along the way, to many of whom we appropriated pseudonyms. One such group were the people who became known as ‘Team Singapore’, three young men from the island nation who were somewhat lacking in the equipment department. One of them commenced the trek with a footwear stocktake totalling a pair of thongs and a pair of new sneakers. Unfortunately for him, his sneakers were not only not worn in, but they were also purchased as fakes from a market – and therefore fell to pieces on the first use. Luckily though, the porters worked through the night to hand stitch the sole back on to his counterfeit shoe, which made it through the rest of the trip. Day 2 was always going to be the big one, the day everyone dreads. 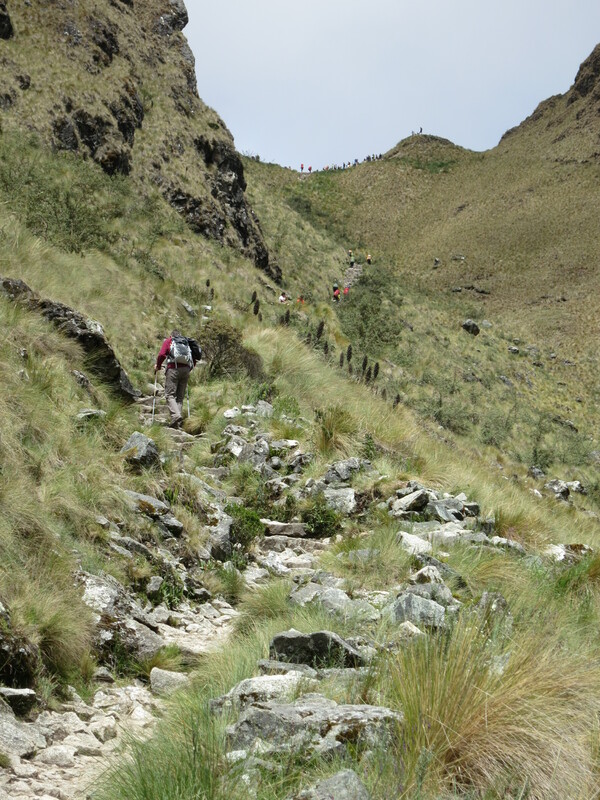 A 900 metre ascent up Dead Woman’s Pass, 600 metres of constant stairs downhill before a late lunch, then heading 400 metres up and down the second pass (4000m altitude) to our camping site. And when I mention distances here, I mean vertically. Make no mistake, Dead Woman’s Pass was quite tough, but it was not insurmountable. 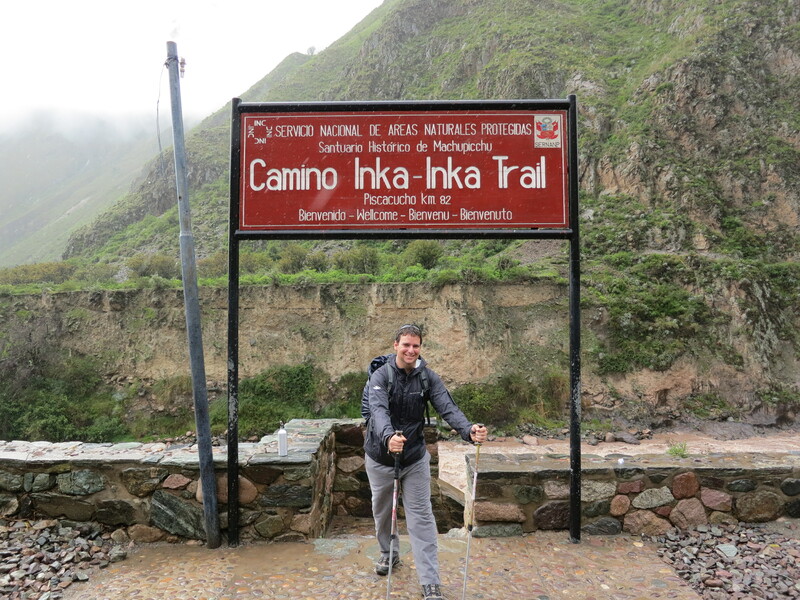 We had a 63-year-old scientist on the trip, so if he could do it, most should be able to get through it – fitness should not be an obstacle to undertaking the Inca Trail, and I should know. Slow and steady was definitely the name of the game. Short minute long breaks after every few minutes at a good cadence got me through it. It was a very long morning repeating this for the full 900 metre ascent. As the mountain pass appeared closer and closer, my confidence grew, and amid a great burst of adrenalin, I started sprinting up the final fifty steps to the top. It all began so well, I was jumping quickly, sometimes two steps at a time, the end was in sight. Disappointingly, I could not replicate my successful former daily routine on the QUT Kelvin Grove steps from the busway platform to the quadrangle some six stories uphill. I collapsed in a heap about twenty steps short, and spent the next four minutes or so catching my breath. When I did make it to the top, I felt accomplished to have done something I have never pushed myself to do, and that I was glad that the hardest was behind me. After lunch just as we were embarking on the afternoons hiking, right on cue, it started to sprinkle. Then pour. Then hail. There was nowhere to take shelter, turning back was not an option, and the precipitation did not stop for two hours. Until placed in that situation, you have no idea how motivating a torrential downpour can be – I developed super-human strength and ascended the second pass in record time with barely a break on the way. I was so very proud of myself, but also quite wet, as I had discovered on the way that my pants and boots were not as waterproof as first thought. I secretly hoped the valley on the other side would be dry, but it was not. The trail itself, mostly a staircase paved with rocks, turned into a waterfall. Some joked that the torrent was fast and steep enough to raft down. Nevertheless, armed with my two walking sticks, I descended the mountain at a blistering pace, overtaking many slower people on the way, and made it to camp saturated, but in the lead pack. That night our clothes didn’t dry, and there was little that could be done. We just had to trudge on. By this stage, there was a loosely established order to the way we hiked. Adam and Abby were first, always, and were more often than not closely followed by Michael. They were then followed by the rest of us in a fairly consistent and repeatable order roughly corresponding to our fitness levels. Day 3, by comparison, was easy. Some more ‘flats’ for the first couple of hours (this time, ‘flats’ were a relief more so than a curse), and then a 1000 metre descent. I could feel the air getting fresher (and denser) as we went down the hill, it was exhilarating. 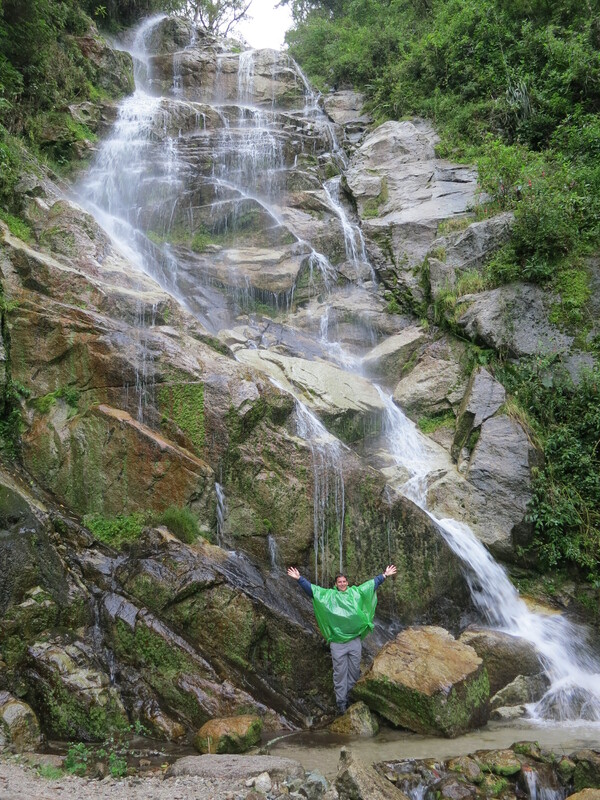 We made it to the bottom by lunch and enjoyed a nap, before getting to explore the Inca ruins of Wiñay Wayna and dipping into the so-called nearby Fountain of Youth, a waterfall that is said to stop the aging process where the water touches the skin. Though I suspect it is an attempt by the tour guides to get the ladies out of their clothing. I stood under the waterfall in a poncho and jacket, but some water dripped down my neck underneath my clothing, so when I am 50, I expect to have streaks of supple skin separating vertical stripes of wrinkles. Sickness was a constant concern, but no one went down and out. We almost had a casualty on the first day, when one person succumbed to a stomach bug, but persevered and made it to camp before sleeping it off. Others suffered headaches and shortness of breath from altitude sickness, or early signs of the flu, while yours truly woke up one cold morning with a painfully sore throat that threatened to turn into tonsillitis. Luckily, it passed within a couple of hours. By Day 4, however, we were no longer acting as pairs, we formed a unified team. Our mission, was to wake up early, pack up early, eat breakfast early and then hurry up and wait. We were successful, as a group, we were not far from the front of the queue for the final control point when we arrived at 4:15am, and we only then had to wait until 5:30am for the point to open. Our goal then was to make it quickly to the Sun Gate before the sun came up over the mountains and started shining on the spectacular Machu Picchu. Despite being made harder by it being Summer Solstice, we made it with only a couple of minutes to spare. Machu Picchu was quite incredible, the architecture was incredibly aesthetic, they knew how to make the lay of the land work for them. The masonry was incredible given the primitive tools and resources at their disposal. The fact it has withstood countless earthquakes is proof of the craftsmanship. And then of course there was the scale, it was grand, and it’s location on a hill with a vista from every window was a testament to this. It was simply breathtaking, and even light rain failed to spoil the moment. We developed quite the antipathy for the lazy day-trippers who would cheat and catch the train and bus to get there, because by that stage we had lived and breathed it for three and a half days. They didn’t deserve to be there. 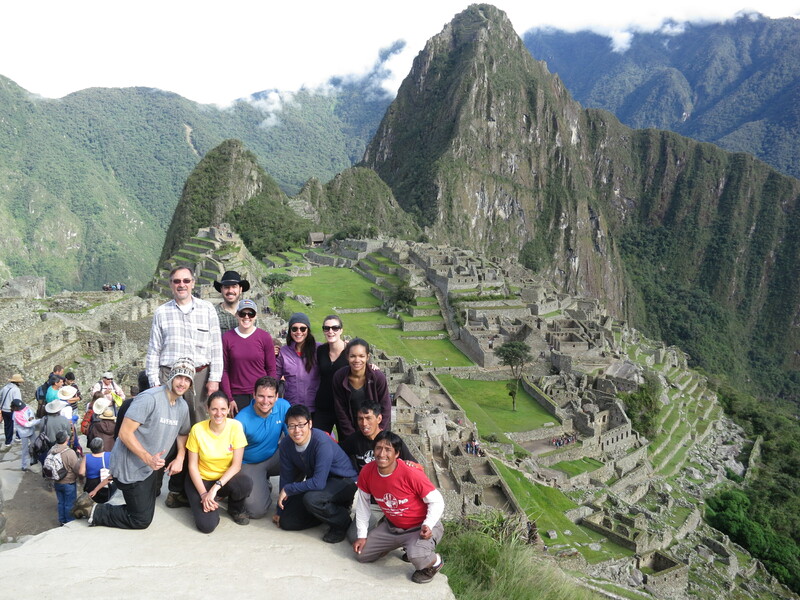 We were now Incas; this place was ours. That was until about 1pm. At that time, we caught the bus down to the nearby town of Aguas Calientes (literally ‘hot waters’), ate an overpriced lunch at a restaurant that the tour company was obviously getting a kickback from, and strolled up to the hot springs after which the town was named where I was reacquainted with this magical, multi-purpose solution called shampoo. It was liquid bliss.